By Adam Lambert Fan & Artist @CreativeSharka: " "Slow cookin 😉" New chibi @adamlambert Enjoy it." 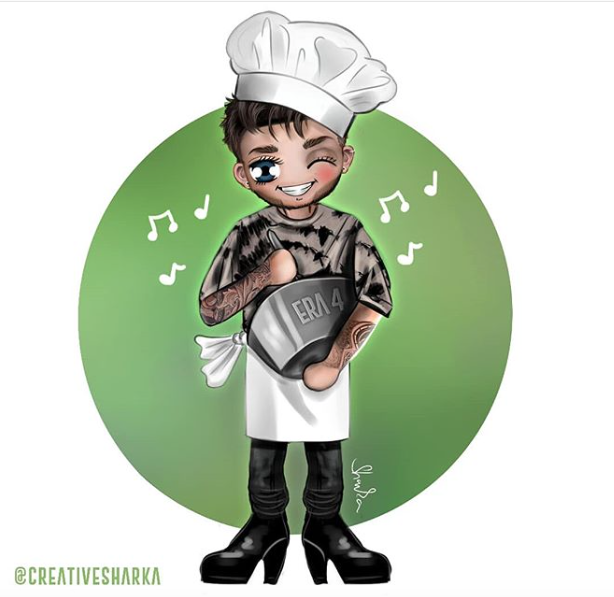 In response to Adam Lambert's tweet (below with LINK) about working on his New Era music, Adam Lambert fan & artist @CreativeSharka has "cooked up" a new chibi of Adam doing some "slow cookin 😉"
Adam's tweet (LINK): "Been in the studio a lot this past week and w many more sessions booked before I make my way down to Oz and NZ for more @QueenWillRock tour dates in FEB & March. Feeling super inspired!!! New Era on the stove simmering on low heat. Slow cookin for maximum flavor." Love Chef Adam! I hope he's cooking up something delicious! Another Masterpiece for us to feast on!! Thanx ADAM!! And Thanx to you too CreativeSharka ... another cutie chibi!! I Love them all! !